Preparing for pandemics: What diseases will be the next Ebolas? Three factors predict whether a new virus will cause a human pandemic. 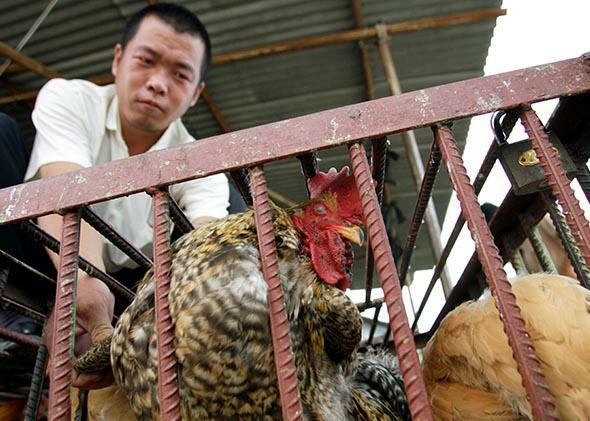 Animals sold in markets can pass lethal viruses on to humans. The Ebola outbreak caught us all off guard. As an infectious-disease physician who practices in Manhattan, I readily answered basic questions about the virus, but I got uncomfortable as soon as things got nuanced. Could it go airborne? I didn’t think so, but I wasn’t sure. And that’s because I wasn’t prepared for it. None of us was. Any new health threat comes with uncertainties, which can be twisted into the suggestion that experts don’t really know what they’re doing. In the worst cases, this leads to panic or suspicion of medical advice. Part of preventing that scenario has to do with better communication and public relations. But a much larger part involves knowledge. Infectious-disease discovery must become a public health priority. We need to know what diseases are out there and which ones are coming for us; we need to be prepared. Scientists estimate that between 1940 and 2004, 335 new infectious diseases appeared in humans. This number includes pathogens that likely entered our species for the first time, such as HIV, and newly evolved strains of familiar organisms, such as multidrug-resistant tuberculosis. The majority of these diseases—about 60 percent—were caused by zoonotic pathogens, meaning they were transmitted to humans from animals. And of those, about 70 percent were from animals that typically live in the wild. (Two of the last global pandemics—SARS and Ebola—were caused by viruses that appear to live in bats.) Interestingly, the percentage of human diseases coming from wild animals seems to be rising—and quickly. But why? And more importantly, what can we do about it? Daszak is trying to give us answers. As president of the EcoHealth Alliance, he leads a team that has analyzed hundreds of new infectious agents, trying to determine the factors that allow a disease to make the leap from animal to human. His group does this by traveling to biodiversity hot spots—Bangladesh, Malaysia, Brazil—to sample wildlife known to harbor unstudied viruses. When team members discover one, they enlist mathematicians to run computer models to predict the likelihood of human transmission. 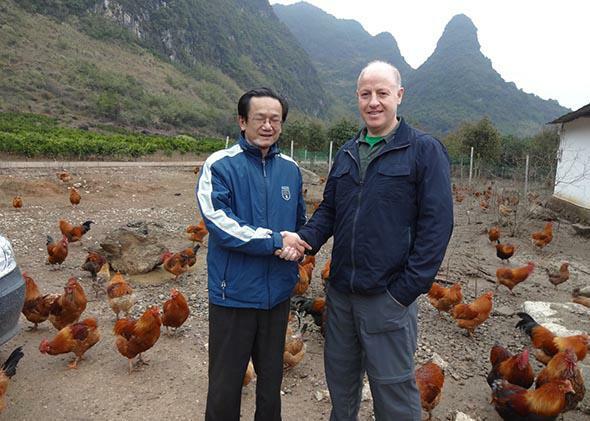 Daszak, right, at a free range poultry farm in China. This type of investigation, referred to as mathematical epidemiology, has long been the basis for our understanding of how most pathogens emerge, evolve, and spread. But the nature of outbreak prediction is becoming more sophisticated, as Daszak and others have increasingly incorporated insights from behavioral economics to improve the quality of outbreak prediction and prevention. Economic behavior plays a vital role in disease transmission. Trade affects the number of humans exposed to a pathogen, which means it’s possible to model a potential outbreak as a function of commerce. This approach, referred to as economic epidemiology, has recently opened up a new set of prediction tools and prevention strategies. 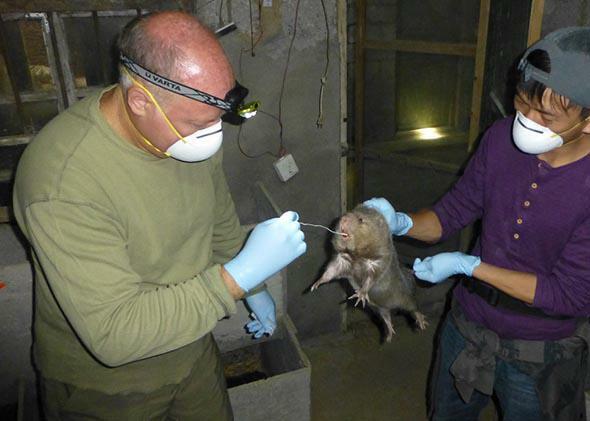 Daszak, left, at a rat farm in Guangxi Province, China. There are believed to be about 320,000 viruses in the world that infect mammals (some estimates push that number even higher), and it’s been projected that it could cost about $6 billion to discover and characterize them. “In the next 20 years, we’ll find all of them,” Daszak said. “Then we’ll figure out which ones are the most likely to emerge as a global pandemic.” Given viruses’ high mutation rates and abilities to colonize new hosts, the next pandemic will likely be caused by a virus. Recently, two candidates have emerged: Nipah virus and Rift Valley fever. Nipah was identified in 1999 after a cluster of Malaysian pig farmers developed encephalitis. (The virus is named after a village where an infected patient lived.) Farmers were developing a sudden onset of fever, headache, vomiting, and diffuse muscle aches; 60 percent were in a coma within one week of becoming infected and more than 70 percent died. Infection occurred through direct contact with respiratory secretions and urine from infected pigs. More troublingly, there was also evidence that Nipah may have been transmitted from person to person—a Malaysian nurse who cared for infected patients was found to have the hallmark blood and brain abnormalities of the disease, despite the fact that she had no exposure to infected animals. The Ebola epidemic in West Africa isn’t over, but as it recedes from the headlines, it’s time to consider what’s coming for us next. Pandemic prediction isn’t cheap, but waiting for an outbreak to happen can be even more costly. Economic losses due to SARS were estimated to be anywhere from $15 billion to more than $50 billion; the cost of the Ebola outbreak will almost certainly exceed that figure. By contrast, Daszak estimates that it would cost a total of $6.3 billion to discover all of the viruses that infect mammals—a fraction of the cost required to respond to a global pandemic like Ebola or SARS—and that information will ultimately lead to better disease monitoring, treatment, and preventative measures at the cusp of the next outbreak. It’s a massive endeavor, but a necessary one. Once we know what’s out there, we’ll be able to figure out what’s coming for us.